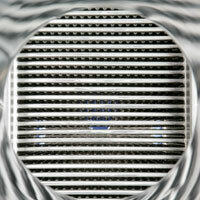 Using a Compabloc Free Flow condenser ensures trouble-free operations. Its all-welded, robust design makes Compabloc Free Flow insensitive to heat and cold shocks. Compabloc Free Flow is available in highly corrosion resistant materials, making it the perfect replacement for graphite blocks or shell-and-tubes. The compact size leads to low installation costs when retrofitting. Existing support structures can be reused and the installation space will always suffice. Compabloc Free Flow allows you to pack more capacity into an existing space, making it the ideal condenser if you need to increase capacity and space is a limiting factor. The compact size also leads to low investment costs when exotic materials are needed. The smaller the condenser, the less material goes into building it. With Compabloc Free Flow you cut operating costs. The high thermal efficiency means it requires less cooling medium than a shell-and-tube or graphite block. Alternatively you may use a less costly cooling medium at a higher temperature. The wide free flow channel gives Compabloc Free Flow a very low pressure drop, making it ideal for deep vacuum condensing duties. Maintenance costs are minimal for a Compabloc Free Flow. The highly turbulent flow minimizes scaling on the cooling media side and makes cleaning-in-place highly efficient. Compabloc Free Flow is designed to withstand tough conditions, and its sturdy construction makes repairs very rare, ensuring maximum production uptime.